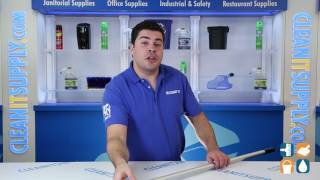 Coming with a durable plastic head that is connected to a durable aluminum handle, the Rubbermaid Side Gate 60" Aluminum Wet Mop Handle is a fit for commercial business, as well as an essential tool for cleaning industry. Coming with a locked-in antimicrobial agent that protects against bacterial growth, this handle comes with a hinged side gate lets mop easily slide on and off. This quality handle also boast a thumbwheel clamp that keeps the mop head in place, while allowing for a quick release bar and easy mop head loading. 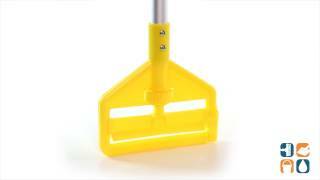 For narrow or wide headband mops, this handle is perfect for professionals such as janitorial companies and maid services.